's goal is to provide breeders with the information you want to know about. 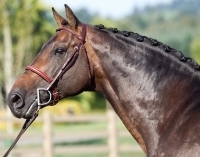 Sign up for our monthly Warmblood Breeding email Newsletter, which covers topics for breeders, such as new stallions, interesting articles, contests, events and more. Each e-News contains helpful information as well as North American and International news. If you're a stallion owner, be sure to sign up for Stallion News as well, with specialized topics of particular interest to stallion owners. Sign-up is part of registering as a user of this site. If you're already registered, you're already signed up. It's easy to manage your preferences through your My Account area. You can edit the topics you'd like to hear about, enter a different email address, or unsubscribe. If you'd like to receive our e-Newsletter, and you're not yet registered as a user of this website, click below to register. You will have the opportunity to select your e-Newsletter preferences as part of the registration process.